Have you seen your neighbor’s electric pressure washer and got curious about it? Do you know that there are benefits and features that it has, which will help you to do tedious tasks, a lot easier? This is the reason why there are now different electric pressure washer machines in the market. If you are planning to get one then knowing the best electric pressure washer in the market is important. Cleaning your surroundings outside your house can be a daunting task. The good news is, an electric pressure washer is here to make your job so much easier. You can clean your driveway with it or your car, so you no longer have to hire anyone to do it for you. These are the best electric pressure washer that you can find on the market today. For this review, though, the winner is the Sun Joe SPX3000 Pressure Joe 2030 PSI 1.76 GPM. The reason behind this is because it has the ability to help you wash almost everything from patios to decks and boats. This will ensure that every area in your driveway, patio, or even in your car will surely be thoroughly be cleaned. What is Electric Pressure Washer? An electric pressure washer is a sprayer machine that can produce high pressured water to help remove dirt, mud, dust, grime, mold, loose paint from objects and surfaces, such as concrete, vehicles, and buildings. The majority of the homeowners prefer using an electric pressure washer because it makes their work easier and quicker, which is the reason why it is becoming more and more popular. Having an electric pressure washer means you will be able to clean the surfaces around you efficiently and in a short period. They will also ensure that your floors won’t be slippery and will be free from any debris, which can cause accidents and such. Electric pressure washers are known to be maneuvered easily, which means that no matter how small the spaces are, the washer will surely reach that area. Larger areas won’t have any problems as well. Just make sure that, since this is a pressure washer, you don’t need to be cautious about overloading it. This type of pressure washer produces heat, which can be used to handle the jobs that are known to be the toughest. The reason behind this is because heat can help boost the power of cleaning. Another good thing of having an electric pressure washer is that they are very durable, compared to the usual cleaning tools used to clean surfaces. This type of machine has a strong shaft motor, and drive system. The rate of flow is measured using the liters for every minute. If the flow of your washer is high, this means that the pressure will be lower. For instance, if your washer has a rate of 24, it will help you to get results faster, which is a good thing for you. Your home can have different types of contaminants, like algae, mildew, mold, dirt, and there are even some that can be fatal for the health. Start washing your patio, porch, walkway, and driveway to ensure that these bacteria will be prevented from growing. This can also help in preventing injuries, which is caused by falling and slipping. Also, your surroundings will surely be well maintained and cleaned as well. Another benefit that you can experience is that it can help add value to your home. The reason behind this is mainly because of your well-maintained home surroundings. These are the benefits that you can get from using an electric pressure washer that you will surely find useful not only for you but your family as well. There are two types of an electric pressure washer, which are the hot and the cold pressure washer. If you need something that will help you to clean your surroundings thoroughly, then the hot water pressure is the one that you need. The cold water pressure, on the other hand, is usually paired with a washer detergent that is especially made for a pressure washer. The PSI is the strength of the water pressure that you need for the cleaning tasks done outdoors. If you want a PSI that is higher, this means that the power of cleaning will be greater. If you are just planning to wash your car, then a PSI of 1200 to 1400 will do. For cleaning vinyl siding and driveway, then a PSI of 2200 to 3500 pressure washer is more ideal. Typically if you are just going to do some average cleaning, a PSI of 1500 to 2000 will do. The next thing that you need to look for is the type of pump drive that the pressure washer has. Usually, the type that you will choose will depend on how often you are going to use the machine to clean outdoors. For light to medium cleaning, the direct drive would be best. But for heavy duty cleaning, the belt drive is perfect, which can help you to work on an average of twenty hours or even more per week. The last thing that you need to do is to check the cleaning units of the pressure washer that you are eyeing. Choosing a cleaning unit that is high will give you a pressure washer that cleans thoroughly. Here is a video on how you can choose the best electric pressure washer. Now that you know how to choose the right electric pressure washer for you, then you may be wondering what the best pressure washer machines to choose from. Below are some of the best that you can have in the market. Sun Joe SPX3000 Pressure Joe 2030 PSI 1.76 GPM can help you clean lawn equipment, patios, driveways, decks, boats, trucks, cars, buildings, and homes. This machine is equipped with a 14.5 amp motor, a PSI of 2030 and a 1.76 GMP of water to ensure a maximum cleaning performance. It also has removable tanks system for your detergent, wherein it can store two kinds of detergent. This means that you can conveniently switch from not detergent from another. 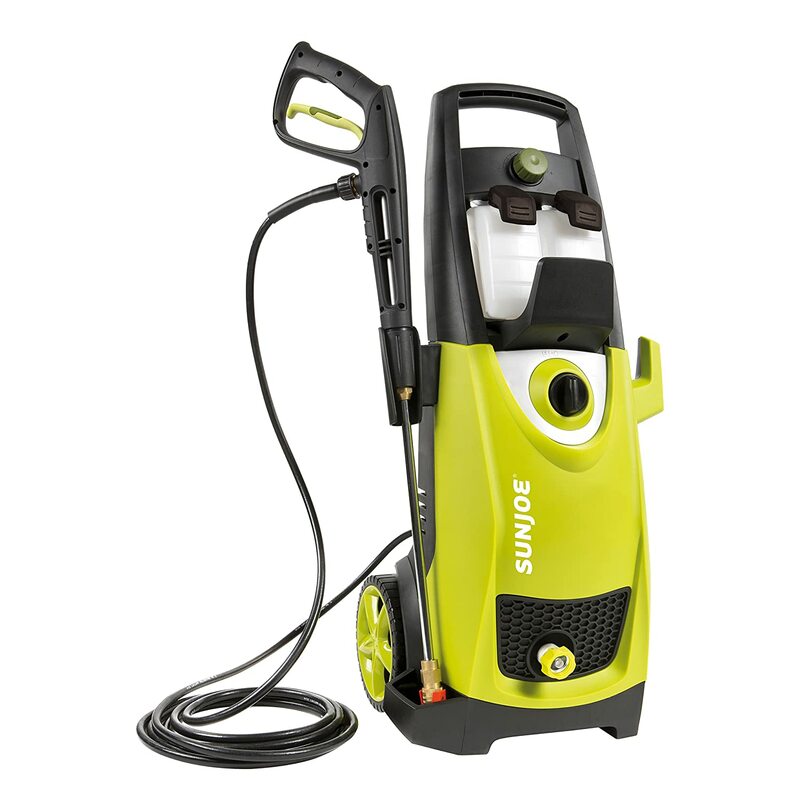 The Sun Joe electric pressure washer also features a safety lock switch, wherein the pump can shut off automatically when the trigger isn’t engaged. This will help to save more energy and prolong the life of the pump. This electric washer pressure comes with different accessories like the removable detergent tanks, extension wand, foot power cord, high-pressure hose, hose adapter and 5 tips of connecting spray. GreenWorks GPW1702 13 amp 1700 PSI 1.2 GPM will surely help remove all sorts of dirt from your fence, driveway, patio, motorcycle, RV, and car. This machine doesn’t necessarily need higher powered electricity which means that you can use the 120 volts power that you usually have at home. 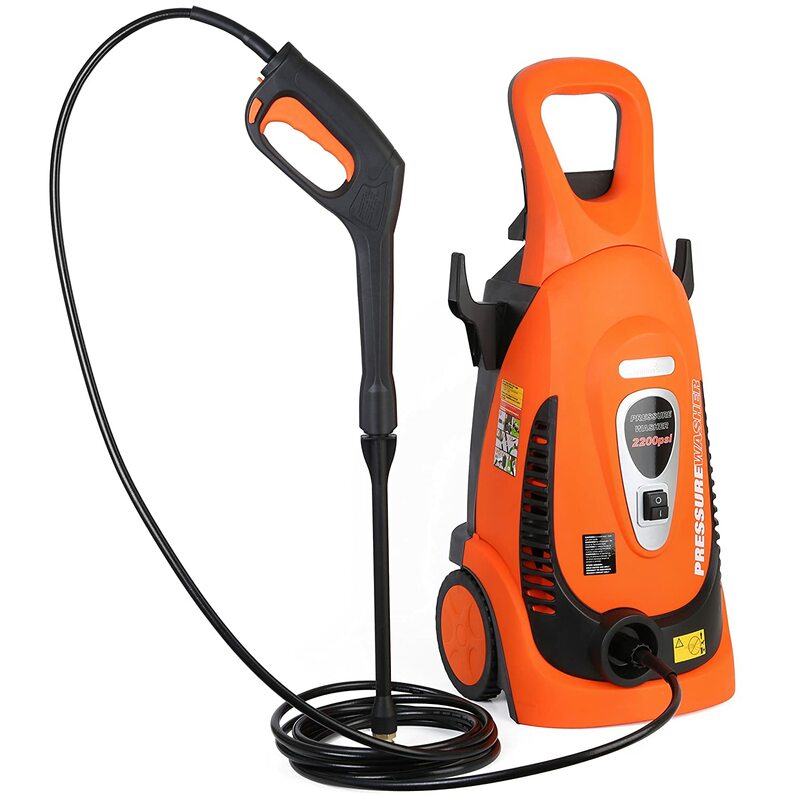 This electric pressure washer is consist of an axial cam, which you can easily connect the hose HP. Also, you can use the machine horizontally or vertically, since it is known to have good stability. 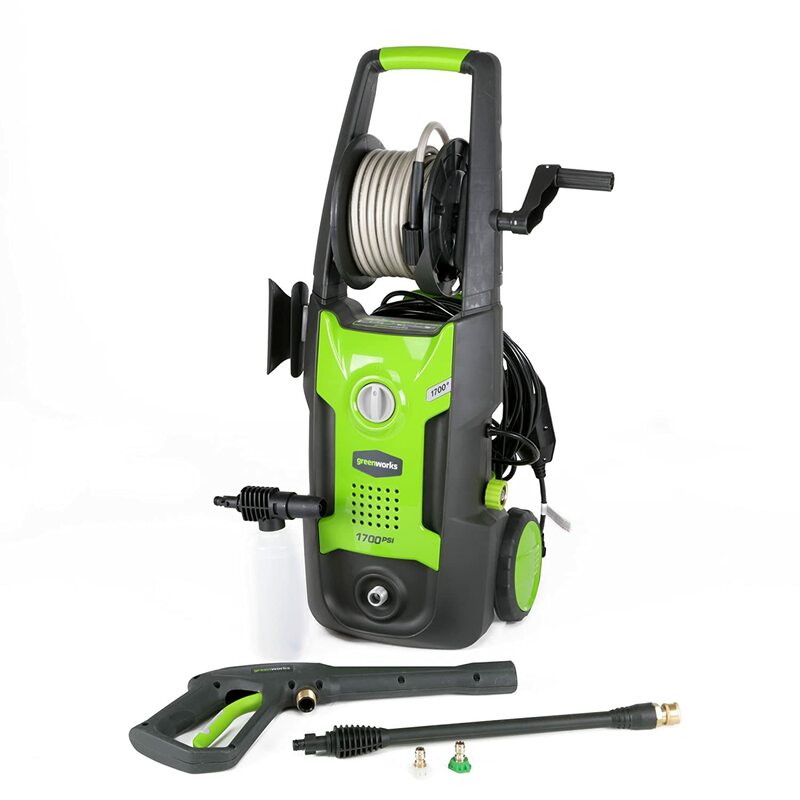 The GreenWorks electric pressure washer also provides a higher pressured hose that measures twenty foot, which can easily be connected at the spray gun’s rear side. The cord’s length measures thirty-five foot and is made out of GFCI plus, so you no longer have to worry about working on a ground that is wet. Lastly, the wheels are made out of plastic, which will give you a maximum maneuverability. 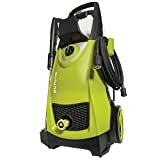 Ivation Electric Pressure Washer 2200 PSI 1.8 GPM is carefully designed for versatility, for you to be able to perform a cleansing task that is diverse for your lawn equipment, patio, vehicle, and others. The 2200 PSI will help you to clean different types of surface, so you no longer have to worry about anything at all. It also features an auto shutoff pump, which will turn the machine off once you are no longer using it. The Ivation electric pressure washer is consists of five interchangeable nozzles, a tap damager, and a gun hose, which can all be setup easily. If you don’t have a garden hose at home, worry no more since the machine features a self-suction, which can help enable a standing water. 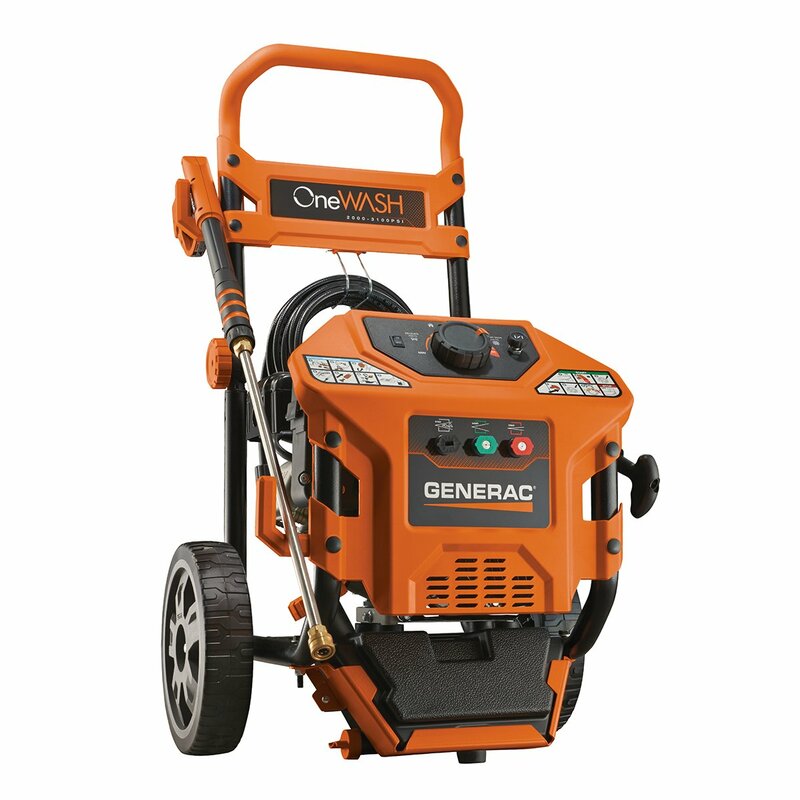 Generac 6602 OneWash 3,100 PSI 2.8 GPM features a powerful and large engine. It is composed of a PowerDial that is innovative, which can provide a control at the dial’s turn for you to be able to adjust quickly the spray’s intensity. This will help you clean different surfaces with just one control. Another good thing about this machine is the compactness that it has because it can help you to save more space in your garage once you store the electric press washer. This also means that you can also transport it easily. The Generac electric pressure washer is equipped with a 3.4 integrated gallon tank with a draining plug, which will provide storage for your cleaning detergents. The good thing about this is that you can quickly empty and clean the tank using your garden hose. If you are going to connect a hose, you no longer have to kneel down on the ground since the machine features a hose connection that can easily be accessed. Simpson Cleaning MSH3125-S 3,100 PSI 2.5 GPM can create more pressure and power that will surely help you with your cleaning tasks. It is equipped with an engine from Honda CG190, which will provide you the power and an Axial Cam Pump, which will give you the pressure that you need for cleaning. The machine also has 10 inches of tires that will let you carry every single thing that you want. 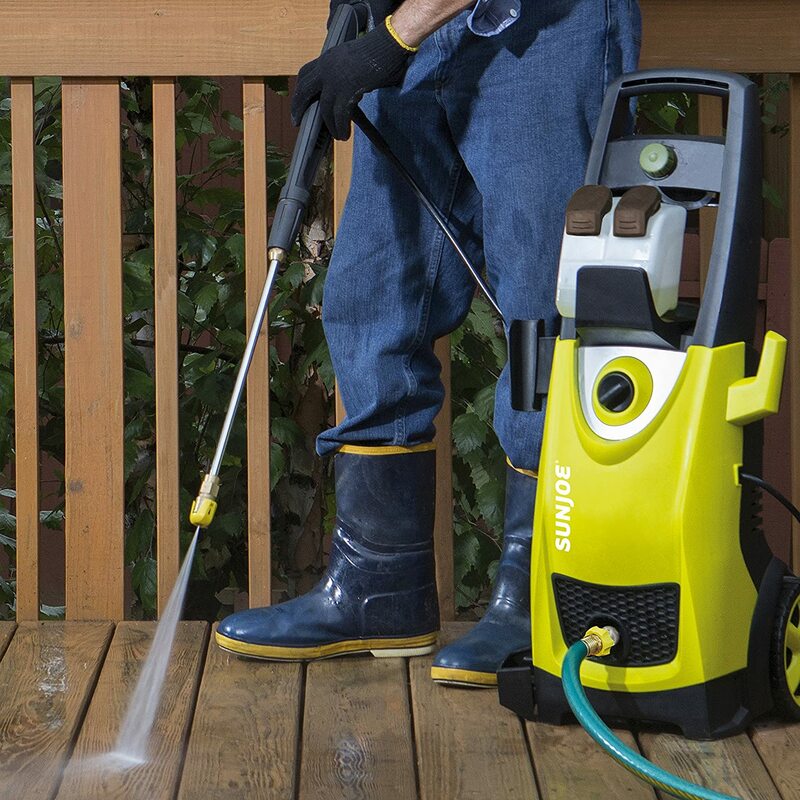 The Simpson pressure washer is equipped with five types of nozzles, which are the 0, 15, 20, and 40 degrees and a tip. Another good thing about this is that the spray gun which has a safety lockout to ensure that there will be no accidents and such. Lastly, the OHC premium engine is composts of components that are high in quality, which will provide you with a performance that you deserve. There are a lot of electric pressure washer in the market and them, of course, comes at different prices, depending on the model and manufacturing brand that you will choose. Put in mind that purchasing an electric pressure washer is like investing into something that you can use for an extended period, to help you with your cleaning needs outdoors. Always remember to choose the best electric pressure washer that will give you the features that you are looking for. In this way, you won’t feel the need to purchase another pressure washer, which can be costly.